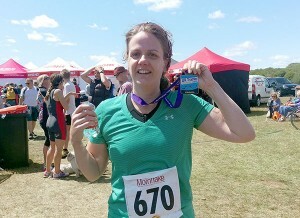 On Sunday 19th July, our Accounts Assistant Jane Green took part in the City of Birmingham Sprint Triathlon. The event was made up of a 750m swim, 20km bike ride and a 5km run. She completed the event in 2hours 2 minutes and has so far raised £235 for Marie Curie and £325 for Macmillan Cancer Support. We are all very proud of her accomplishment and look forward to her beating her time next year!